They’ve landed on dry lake beds in Nevada, farm fields in Montana, sandbars in the Skagit River. Next, Kyle Fosso and Sam Hagan, both 22, intend to touch down in all 50 states on a year-long airplane journey starting in April from Anacortes. They plan to document the entire trip on video and share it online along the way. “We’re aiming to show people from a unique point of view what their country’s like,” said pilot Fosso, who will fly a 1954 Cessna 170B airplane he restored himself. In a small airplane, you can fly almost anywhere you want and don’t have to stick to big airports or cities, he said. “We want to find places that aren’t attractions, but they’re places and maybe people don’t know much about them, and we just want people to know they’re there,” Hagan said. The pair has been planning the trip for the past two years, but the adventure began with the purchase of the Cessna plane when Fosso was 15. 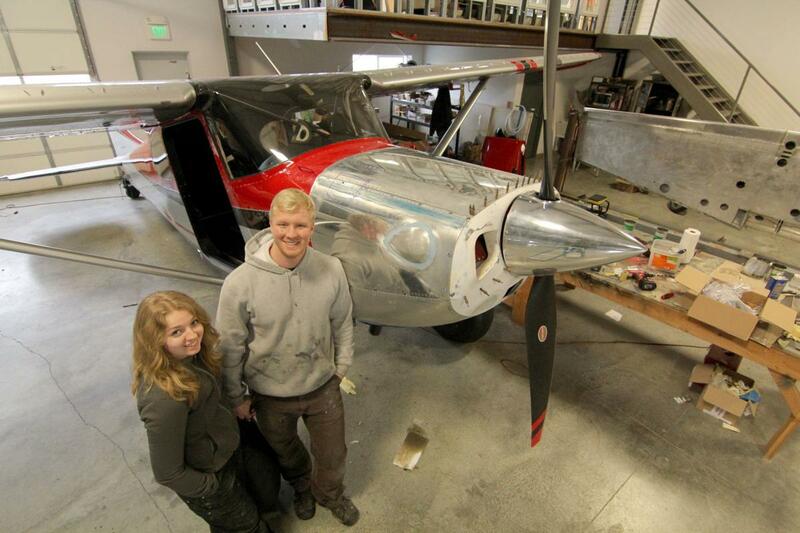 The Anacortes native was working for a mechanic who suggested he buy an “airplane project” like a wing. He ended up buying a whole airplane, a wrecked seaplane in six pieces that had crashed in 1974 in Alaska and had been sitting in storage in Lynnwood for 40 years. At that point, the 15-year-old only had a dozen hours of flying under his belt, but admired the airplane of an Anacortes pilot that was the exact same make, model and engine of the wreck. “I bought (the plane) before I was nearly ready to,” he said, using money saved up from summers fishing in Alaska and a loan from dad. When he started out, he had no idea how to refurbish an airplane. With the help of a mentor, he learned the skills he needed and later earned his aviation mechanic certificate. “I probably built the whole thing twice,” he said. Fosso met Hagan three years ago while halfway through the rebuild, and they finished the project together last year. These days, the two have been spending 16 hours a day at a hangar at the Anacortes Airport, where the plane is stored, finishing upgrades. After testing out the airplane on several shorter trips, they decided to install new wings and a larger fuel system that would perform better on the long journey. The plane is able to take off in about 150 feet, compared to a commercial airliner that needs at least 6,000 feet of space, meaning they don’t have to stick to runways, Fosso said. “We don’t have a fast plane; we have a plane that can land in a lot of places,” he said. Hagan, who is a student pilot, is in charge of filming and fundraising while Fosso takes care of the flying and airplane maintenance. While they plan to mount two cameras on the outside of the plane that will feed into a livestream video, they don’t want to just show flying. As a more ambitious project, they want to create 10-minute, more cinematic episodes about the sights and scenery of each state. They have a system set up to mail hard drives to a video team in Washington, who will release the episodes on a several month delay. Fosso said he wants to show young people that airplanes can be a way to explore new places. That doesn’t necessarily mean a trip to all 50 states, but maybe a flight to Oregon or California, he said. “I hope to inspire (viewers) to say you know ‘these are 22-year-olds with basically no money, and if I ever had the temptation to get into aviation, maybe I should,” Fosso said. The two say this is the right time for the trip. “We’re adult enough to do it, but we’re not too adult,” Hagan said. Fosso works as a self-employed aviation mechanic, and Hagan most recently worked in retail. Over the years, the hardest part has been taking any job for any amount of money to work off the airplane debt, Fosso said. The couple is funding the trip through donations on their website, where patrons can donate and receive exclusive content in return. They’ve also secured a sponsorship from SeaBear Wild Salmon. Fans around the country who have followed their progress over the years have offered room and board, Hagan said. They haven’t nailed down a route yet, but plan to stay north in the summer and south in the winter. In July, they’ll fly into Oshkosh, Wisconsin, for the Experimental Aircraft Association AirVenture fly-in, the biggest air show in the world, where Fosso’s modified Cessna 170B plane took home the bronze prize for customized classic last year. “We’re trying to leave it spontaneous,” he said.